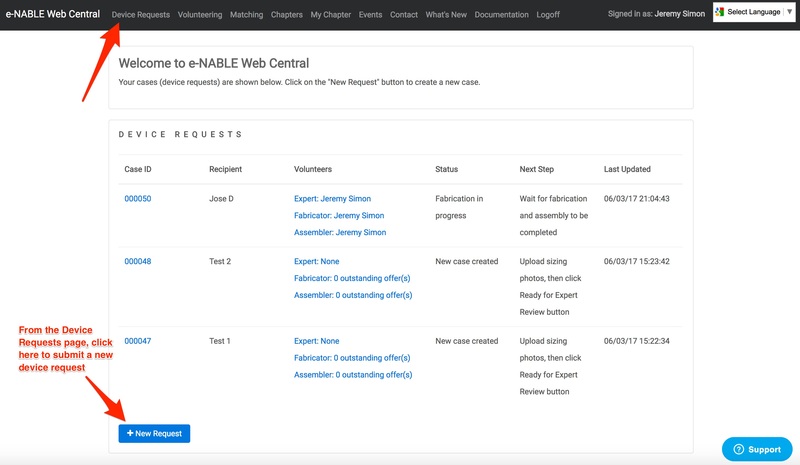 Feel free to check out our video walkthrough to see how to get started using e-NABLE Web Central. When you created a new login for e-NABLE Web Central (EWC), you were guided through the registration process. During this process, you indicated whether you are seeking help, offering to help, or both. This will determine the types of functions you can access within EWC. Everyone has a "Device Requests" page, which will serve as your home page in EWC. Here, you can request a new device and monitor the status of your active device requests. If you are looking to receive an e-NABLE device, your next step is to create a new Device Request. This can be done during the initial registration process or by clicking on the "New Request" button on the Device Requests page. Once you have created a device request, you need to upload sizing photos before e-NABLE volunteers will be able to get started. 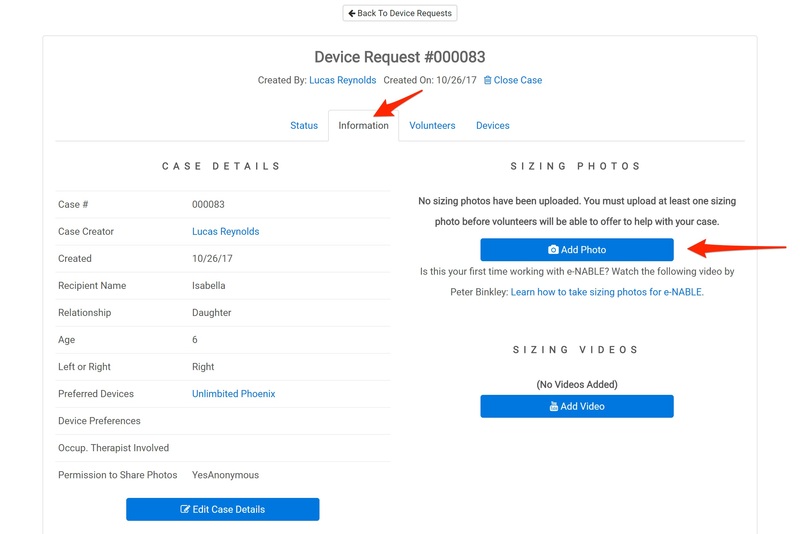 Click on the Case ID on the Device Requests page to go to the Case Details screen and select the Information tab. From there, you can click on Add Photo (and optionally, Add Video) to upload your sizing photos and videos. In order to get a proper fit for devices and to ensure that the sizing is correct, it is imperative that you take images that are at the correct angle and orientation and in a high enough resolution with good lighting. Please make sure to watch the Taking Recipient Photos For e-NABLE video before taking images to submit. Once you are finished uploading sizing photos/videos, click on the "Ready for Volunteer Review" button. This will make your case available to e-NABLE volunteers who can then choose to assist with your device request. If you are a volunteer, please note that you will not see the Volunteering home page in the menu (where you can browse device requests submitted by others) unless you have selected the “Fabricator” and/or “Device Assembler” roles during registration. 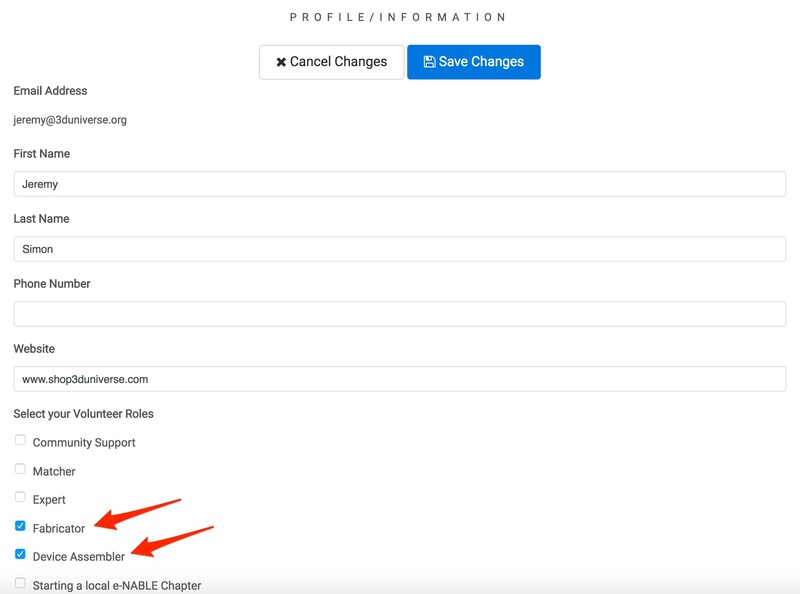 You can edit your selected volunteer roles by going to the Edit Profile page. EWC provides a range of different functionality and is intended to support different types of users. The roles you're assigned will determine which parts of the EWC application are accessible. Fabricator: The Fabricator role is for those who wish to 3D print e-NABLE devices. This role will provide access to the Volunteering page, where you can browse available cases and offer to help. Note that you will only be able to offer to help on cases seeking device types for which you have the corresponding Credly badge (see "Credly Badges" below for more information). Once the fabricator has finished fabricating parts for a device, the parts will be sent to the Assembler. In most cases, the Fabricator and Assembler roles will be filled by the same volunteer, but not always. Assembler: The Assembler role is for those who wish to assemble e-NABLE devices. This role will provide access to the Volunteering page, where you can browse available cases and offer to help. Note that you will only be able to offer to help on cases seeking device types for which you have the corresponding Credly badge (see "Credly Badges" below for more information). Once assembled, the Assembler will send the finished device to the end-user for testing and feedback. Once a case is created, volunteers can make offers to help with that case. Each case needs three volunteer roles - Expert, Fabricator, and Assembler. In some cases, all three roles will be fulfilled by a single volunteer. In other cases, multiple volunteers will be involved in a single case. Each case moves through a series of steps, culminating in the recipient accepting a new e-NABLE device. As EWC is developed further, the user and volunteers will be guided through these steps, with status and next steps being described each step of the way. For now, the process is a little more manual, with the volunteers providing status updates and next steps via the Case Details screen. 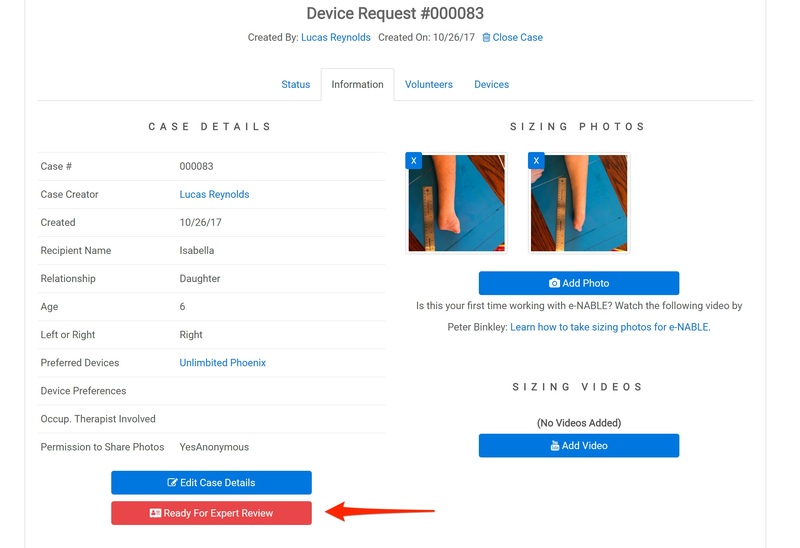 New Case: When a new case is created, the first step is for the user to upload sizing photos/videos so the e-NABLE volunteers can determine the appropriate device type and scale for the recipient. Within the Case Details screen, the User can add photos/videos and then click the "Ready for Volunteer Review" button. Only after that is done will the case be available for volunteers to get involved. Expert Recommendations: Once a User uploads sizing photos/videos, an e-NABLE experienced volunteer needs to review those photos/videos and provide a recommendation for the best type of e-NABLE device and the scale required for the recipient. An experienced volunteer may recommend more than one device type, along with guidance for the User. Once an experienced volunteer recommendation has been made, the User needs to review the recommendation and either choose one of the propsed device designs, or provide additional feedback and request a new recommendation. Volunteer Matching: Each case needs three volunteer roles to be filled: Experienced Volunteer, Fabricator, and Assembler. Experts can get involved in any cases and offer their recommendations based on the sizing photos/videos provided. Fabricators and Assemblers can offer to help on cases for which they have the appropriate Credly badges (depending on the device type being requested), but these offers need to be approved by the User. If a Fabricator wishes to offer help on a case that has not had a Volunteer Review, the Fabricator will need to take on the Expert role, reviewing the sizing photos/videos and making a recommendation to the User for device type and scale. Device Fabrication: Once a Fabricator match is approved by the User, that fabricator will begin fabricating the device according to the chosen device type and scale (which will appear on the Case Details page). The Fabricator can click the "Add Case Device" button within the Case Details page to add a record for the device being fabricated. The Fabricator will specify details about the device, such as device type, scale, colors, material being used, etc. When fabrication of the parts has been completed, the Fabricator can upload photos to the Device Details page. The parts will then be sent to the Assembler (unless the same volunteer is filling the Fabricator and Assembler roles). Change Request: If a User requests a change, the Experienced Volunteer for that case will review the change request and determine the appropriate course of action. If a new device is needed (i.e. the device didn't fit properly), then the Fabricator will be asked to start fabricating a new device. If the existing device can be used but requires adjustments to the assembly (i.e. adjusting tension of cords, etc. ), the Assembler will be asked to make the appropriate adjustments. Within the Case Details screen, you'll find a Message Board. Here, you can exchange messages with other case participants. Messages can include attachments. Any message posted to the case's Message Board will be visible by all volunteers assigned to the case. In the future, you will be able to send messages to specific individuals, but for now, the Message Board provides a shared messaging platform that is available to all people assigned to a case. There are lots of features that will be added in the near future. This documentation page will be updated as those features are implemented, so check back often. Visit the What's New page for details about the latest updates and a preview of upcoming features.